Welcome to the Vintage Powder Room Cinema! 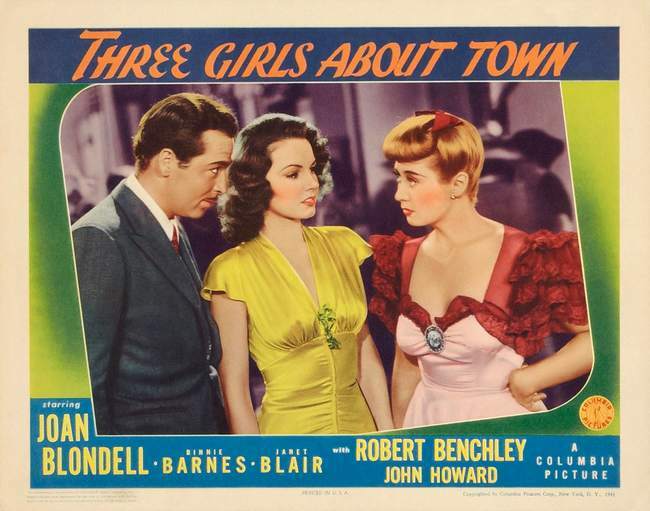 Tonight’s feature is THREE GIRLS ABOUT TOWN starring Joan Blondell, Binnie Barnes, Janet Blair, Robert Benchley and John Howard. As the Merchants Hotel readies for a morticians convention and the mediation committee meeting of a group of aircraft manufacturers and workers, hotel manager Wilburforce Puddle worries about a newspaper editorial critical of the hotel’s policy of employing hostesses. Angered by the editorial, head hostess Hope Banner storms into the hotel press room to confront her fiancé, reporter Tommy Hopkins. Tommy denies that he had prior knowledge about the editorial, although he would like Hope to resign as hostess and find a “regular” job. Hope, however, argues that she needs the extra money to send her younger sister Charity to private school. After Hope leaves, Charity appears in the press room looking for her sister, and Tommy escorts her to Hope’s room. There, Charity announces to Hope and her other hostess sister Faith that she intends to quit school and follow in her sisters’ footsteps. Both Faith and Hope oppose her decision, asserting that she is too young and innocent to leave school. Welcome to Vintage Powder Room Cinema! 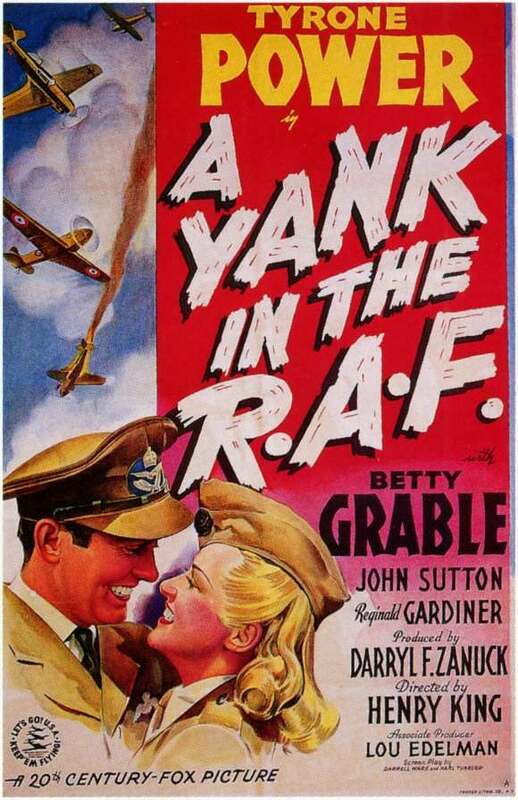 In keeping with the theme of yesterday’s post, victory rolls and the Greatest Generation–this week’s feature is A YANK IN THE RAF starring Betty Grable and Tyrone Power. Enjoy the movie! Prior to the United States’ entry into World War II, egotistical American pilot Tim Baker seeks adventure and money by ferrying a bomber from Canada to England. While in London, he meets a former girl friend, Carol Brown, a nightclub performer who volunteers in the ambulance reserve during the day. Carol is both pleased and annoyed to see Tim, with whom she broke up a year earlier because of his irresponsible nature. Hoping to win Carol back, Tim accepts her dare to join the R.A.F. but quickly becomes bored with the classes teaching basic flying techniques. One afternoon, Carol goes to the airfield and meets Wing Commander John Morley, who is immediately taken with her. Morley sees her nightclub show and escorts her home, after which Carol, angry at Tim for standing her up that evening, tells him that she has a new man in her life. Welcome to Vintage Powder Room Cinema! 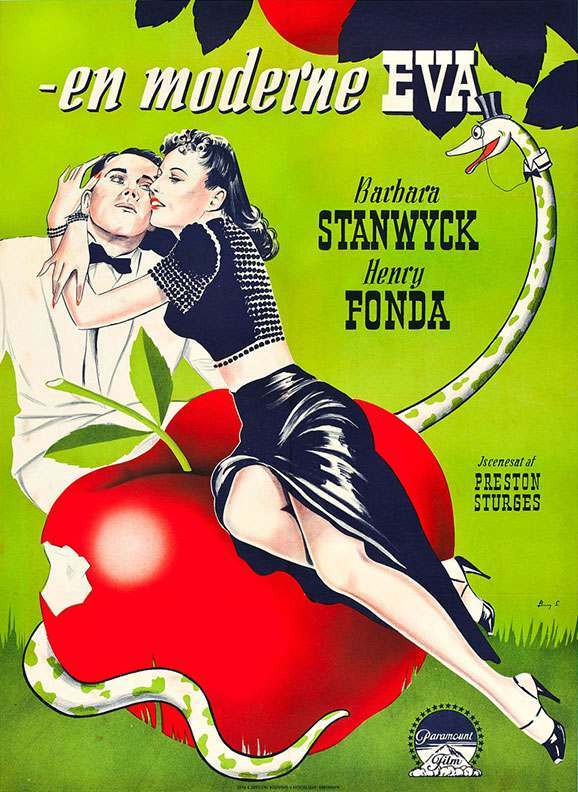 This week’s feature is directed by Preston Sturges and stars Barbara Stanwyck and Henry Fonda. Enjoy the movie! After Charles Poncefort Pike, an ophiologist and heir to the Pike’s Pale Ale fortune, leaves a zoological expedition in the South American jungle, he boards an ocean liner headed for the East Coast. Although the eligible bachelor only has eyes for his book on snakes and is oblivious to all the young female passengers, Jean Harrington succeeds in getting his attention by tripping him as he leaves the dining room. Jean, a con artist and cardsharp who works with her father, ensnares Charlie with her feminine wiles, and despite the warnings of Charlie’s suspicious guardian, Muggsy, Charlie falls in love with Jean.